Click here for more for applassi fyber android sdk. Published here. resulted following the participation in a Grundtvig professional training mobility, La Otras Orillas (The Other Shores), which took place in Spain between November 23rd – December 2nd, 2012, and financed by the Romanian National Agency on Longlife Learning Programmes – as an activity listed in the dissemination plan following the course participation. The project is adressed to all cultural agents in Vrancea county and open, in general, to all those who want and/or can participate in the promotion of the cultural values of our Vrancea community. Purpose: promoting on international level the traditions, customs, religious, historic, patrimonial monuments, cultural and touristic areas, itineraries and objectives from Vrancea county. The materials are provided for the purpose of the project Potpourri in Vrancea by the goodwill of the partners: Vrancea County Council – president Marian Oprisan, Vrancea County Department for Culture and National Heritage – manager Florin Micu Iliescu, Panciu Townhall – mayor Ion Petre, Local Television Atlas TV – manager ec. Ion Martiş, and Valentin Muscă. In discussion, documentaries from Bucharest National Television TVR and „Open Day” Foundation, Focşani. The materials represent documentaries about Vrancea county culture and tradition, are made by the institutions and people mentioned above and published on the Potpourri Association site only for the purpose of promoting Vrancea cultural heritage. Some of the documentaries presented on this project have never been, partially or fully, broadcasted on an official channel (television or on-line). We thank you all for your support and involvement! 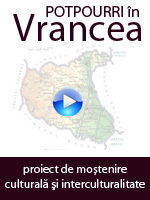 „Vrancea, the land where history meets legend”, the documentary made by Vrancea County Council, was selected for presentation during the 6th edition of the Romanian Movie Festival, which took place between December 12th-16th, 2012, in Montreal and Toronto, Canada. The documentary is made up of five parts and introduces Vrancea county’s touristic attractions – Wine Road, Road of Glory of the Romanian Army, Lepsa- touristic site, as well as the unique local traditions – Chiparuşul (Dance of the dead), Wine Craft and Blessing of the Sheep. 2. Pilgrimage in Archaic Vrancea – Vrancea’s Wooden Churces, 110 min (part 1 and 2) – County Department for Culture and National Heritage. The documentary is published and fully broadcated for the first time by the Potpourri Association. The documentary was made by the County Department for Culture and National Heritage in 2010-2011 during the project „Pilgrimage in Archaic Vrancea – Vrancea Wooden Churces”. The two parts of the documentary present 20 wooden churches of the Vrancea county, 10 of which are considered to be of national interest – Corbiţa Church from Lărgăşeni village, Moviliţa Church from Chiţcani, Prisaca and Mătăcina Churches from Valea Sării, Valea Neagră Monastery and the two churches from Nistoreşti, Poiana Church as well as the church from Vrâncioaia, Străoane Church, Fitioneşti Church, Lepşa Monastery from Tulnici, Păuleşti Church, Angheleşti and Rugineşti Churches from Rugineşti, Poiana Mărului Monastery, Chiojdeni Church, Odobasca de Coteşti Church, Răcoasa Church and Dălhăuţi Monastery. As Vrancea county does not count so far any of its monuments among those from the UNESCO World Heritage, one of the main goals of the project is to introduce one of these wooden churches on the official list. Vrancea’s wooden churches are living proofs of the historic and cultural heritage. Specific of the XVIIth – XIXth centuries, they are carved in wood by local artisans, and represent outstanding pieces of architecture revealing the values and feelings of the Romanian orthodox beliefs and spirituality, which the artisans embodied so accurately. Discovering and promoting Vrancea’s wooden churches may contribute to discovering and understanding our own self as well as our cultural and spiritual identity. Documentary presenting touristic attractions in Panciu, made as part of the project „Tradition and Spirituality in Panciu – project aiming to promote representative touristic attractions in Panciu, Vrancea county”, implemented by Panciu Townhall. The project is co-financed by the European Union through the European Regional Development Fund– Regional Operational Programme 2007-2013, Priority Axis 5 „Sustainable development and tourism promotion”, key areas of intervention 5.3, „Promoting tourism potential and creating the necessary infrastructure to increase Romania’s attractiveness as a tourist destination„, Operation „Development and strengthening domestic tourism by helping to promote specific products and specific marketing activities„. The documentary, made by the Local Television Atlas TV in 2007 and provided for the purpose of this project from the archives of the television, is dedicated to the local artisan ŞERBAN TERŢIU, who was born and raised in Nereju, where he still lives with his family and works. The village represents for him the only place in the world which connects him with his ancestors from whom he inherited the gift of crafting masks for celebrations, parties and funerals. The same masks cover the faces of old men in Nereju when dancing Chiparusul in the „wake evenings” for the dead people – a pre -Christian custom, unique in the world, which has been dearly kept and practiced enshrined ever since by the villagers. The skill has been in his family for generations, Şerban Terţiu learning from his father, Pavel Terţiu, who, in his turn, learnt from his parents and grandparents. The masks are made of wood or skin, and, if you have the skill, you can make two or three every week. You could also use beans for the teeth or fur from the animals to make the masks. The tools he is working with are also very old, inherited from generation to generation, and are very seldom replaced. In his desire to pass on the tradition, Şerban Terţiu made a group of students from the village and confided the secrets of crafting a special mask, unique in Vrancea and beyond. In his own house, the young people from Nereju learn to weave, to spin the wool, small household chores specific to the area that are no longer of interest for the young people. Nereju is the fairy-tale village where Şerban Terţiu and his family live, and where children learn to pass on their ancestors’ traditions and customs. We could refer to it as an archaic island, an extraordinary world with a peasant culture so amazing that makes you actually picture in your mind a world you could not ever believed it existed, as Dimitrie Gusti used to write. In this remote and isolated place, life and death take their own course. Nereju is a world that lives in intensity and joy, and sorrow, a world that has yet to pass on spiritual values, as these ritual masks made by Serban Terţiu. – Pilgrimage in Archaic Vrancea. Part 1: Wooden Churches, 11 min. – Pilgrimage in Archaic Vrancea. Part 2: Churches from Odobesti, 11.06 min. – Pilgrimage in Archaic Vrancea. Part 3: Monasteries in Mera Woods, 11.26 min. – Tour of Vrancea’s historical monuments, 20 min. – Vrancea – culture, tradition and folk culture, 20 min.